Our final full day in Florence was fun. After breakfast, we marched down past the Uffizi Gallery to Piazza della Repubblica, where we met our local guide Luka again. He started the day by taking us to a typical Florentine palazzo (or palace), where he told us about some of the city’s history and described how the wealthy merchant class used to live. Because I was in a much better mood than the day before, I enjoyed his presentation. The Palazzo Davanzati is the former home of a wealthy family of wool merchants. The house was built in 1516, and has managed to survive until today. It now serves as a museum demonstrating what a typical palazzo might have been like. I found the tour of this home much more interesting than that of Ca’ Rezzonico in Venice, mostly because the Palazzo Davanzati was decorated with real furnishings and art instead of having been turned into an art museum. I was particularly fascinated by the art on the wall of one bedroom, which told the story of the Châtelaine de Vergy, an old French story of romance and courtly love. I think this is ripe for potential re-working for modern audiences. 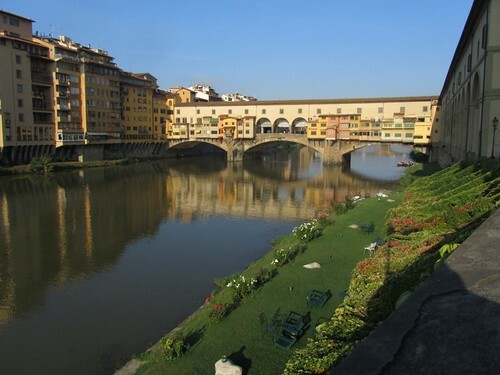 We then crossed the River Arno along Via Maggio to Piazza San Spirito and the church there. The group stopped to eat, but Kris and I struck out on our own. We spent 30 minutes searching for the entrance to a large walled garden nearby, but failed, so we headed back downtown to find lunch. We eventually settled on a hole-in-the-wall place that turned out to have fine food. We were entertained by the three men at the next table, who conversed effortlessly in four languages (Italian, Spanish, English, and German), often switching tongues in the middle of a sentence! They each ordered a gigantic bistecca alla Fiorentina (Florentine steak, which is essentially a T-bone or Porterhouse). Together, the three of them finished two liters of the house red wine. Plus they ate salads and bread. All of this for lunch. After lunch, we toured the Bargello, which is a former prison now turned into an art museum that primarily houses sculptures. Kris and I both learned that we find great sculptures much more compelling than great paintings. They seem much more difficult to create. You can buy all sorts of leather goods in Florence — Kris and I bought belts! This is very typical of the shops we saw on this trip to Europe. Gelato shops are also very common in Italy. These are like tiny neighborhood ice cream stands, except they sell gelato. What is gelato? It’s essentially ice cream, but with a few key differences. Gelato has less butterfat than ice cream, which means the flavors (strawberry, chocolate, whatever) are more prominent. Gelato is denser (or thicker) than ice cream because it doesn’t have any air added to it. Gelato is served warmer than ice cream, which means it melts more quickly. In many ways, gelato seems like home-made ice cream. I actually prefer gelato to commercial ice cream (and I think Kris does too). Really, though, I’m a sucker for both, and they’re both bad for my diet! Kris ordering gelato, something we did once a day in Italy. After a quick pitstop back at Hotel Silla, Kris and I strolled along the River, watching the crowds of locals and tourists. We made our way to the Piazza della Signoria, where we met our tour group for dinner. As we waited, we listened to a street musician playing the guitar. The street musicians were very organized. This fellow was a little late leaving this spot, and the woman who came after him was unhappy. He apologized and packed up as quickly as possible, but I think she felt deprived of a few minutes of prime real estate during rush hour. We ate at Trattoria Nella, where we had creamy gnocchi, penne pasta, veal, and spinach. Though the rest of the group raved about the meal, I actually preferred our other dinner in Florence at Giglio Rosso.